Our lovely house, built in 1907 and formally known as The Woodside Hotel, has been a thriving business for over 50 years. We have refurbished this treasure into a light, more modern and serene venue and renamed it The Artists' Studio - BnB by the sea. 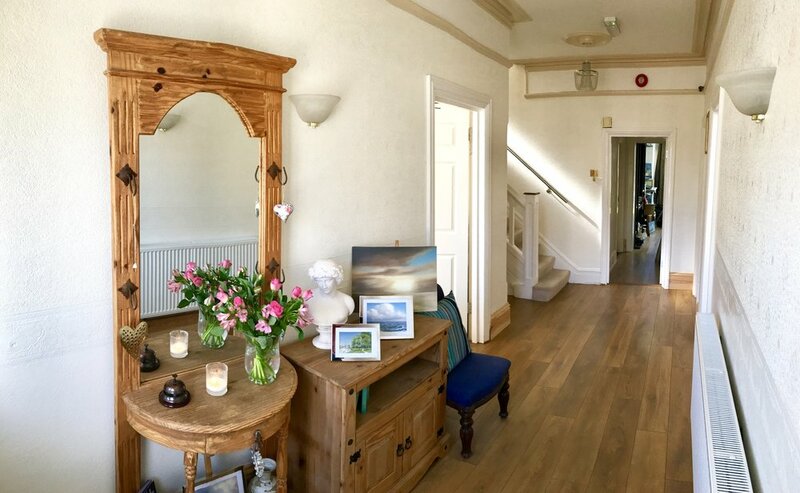 We have 7 bedrooms (a mixture of single through to king size and all ensuite), three floors, and a breakfast room all onsite with our art studio. We are located on a quiet tree-lined avenue just a few minutes’ walk from Bournemouth’s stunning cliffs overlooking a panoramic view of seven miles of beautiful sandy beaches stretching from Poole to Hengistbury Head. Breakfast is included, with a delicious menu that has been thoughtfully put together from fresh, locally sourced produce when available and special dietary requirements are happily catered for. This accommodation will be priced as a package with your course booking and you can bring a guest too! Please contact us directly for room prices, availability and booking. Use the form below to email us or you can phone us on 01202 302702. For more information about our BnB by the Sea, please see our Artist Studio BnB website. or phone us on 01202 302702.